The Pharaoh Hound is wise, complaisant and very amusing. They are hunters so not good for home where non-canine pets live. They do well with children with whom they are raised. They are very shy and should be socialized at an early age. They are good runners and a very faithful breed of dogs. This dog loves the companionship of his master. This beautiful and athletic breed has a short coat that doesn't need much grooming. The coat is short and glossy lying close to the body of the dog. The Pharaoh Hound is weather resistant to a degree. As they are very sensitive so training should be very firm. They do well in warm weather but if protected they also do good in cold climates. As they are hunters so tall fence should be built to keep them in check if necessary. Bathing should be done when necessary. To remove dead hair rubber brushing is okay. 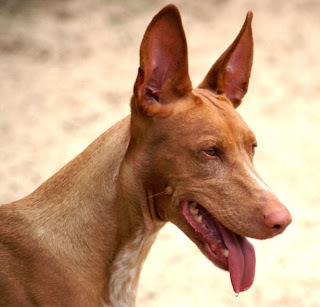 Like all breeds of dogs, the pharaoh hound is prone so some specific dog diseases and health issues these can include, eye abnormalities, aseptic meningitis, epilepsy, hip and elbow dysplasia, patella luxation, hypothyroidism, and food and skin allergies.